Well, we missed this because of the “winter storm.” Anyway, they will still be very close for a few days. 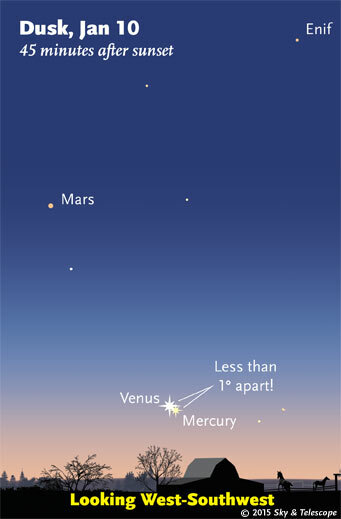 Venus and Mercury are closest together this evening in twilight, 0.7° apart. Look low in the southwest about 45 minutes after sunset, as shown here. They’ll stay within 1° of each other through Monday. This entry was posted in sky watching, What's New? and tagged planet gazing, skywatching on January 11, 2015 by Stewart Dale Spencer.